What are the main problems that you might face? Do you have your own electric meat grinder in the kitchen? How long have you been using it? Does it work flawlessly all the time? If your answer to the last question is a “No”, then it can be safely assumed that you have been using an electric meat grinder for quite some time. For, no matter how effective the machine is, it is prone to certain defects and malfunctioning from time to time. But, don’t worry, you are not alone; there are countless other owners who face similar problems. Problems with the electric meat grinder can be of varied types, but if you possess the required knowledge, solving them will not be an uphill task. While most of the basic problems are easy to solve, some other ones might require the assistance of a professional technician. 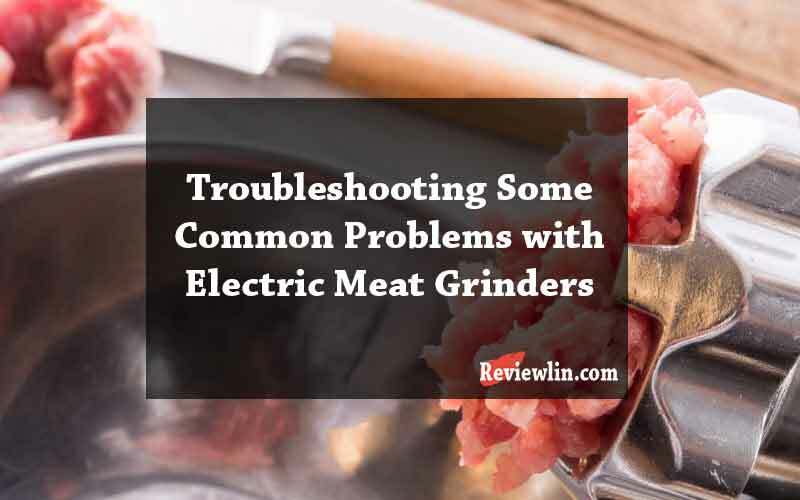 This article contains all that you need to know about the commonly-faced problems with electric meat grinders, and how you can deal with them. Just keep on reading to know more. Thousands of meat grinders are available in the market that does require the rechargeable battery. Always buy the one of the unsurpassed battery and make sure that you are using the correct power supply. Also, you will have to check the outlet power that is connected to the machine. If you are getting the battery with a meat grinder, then it would be the perfect model for you. Otherwise, you can buy the additional battery package from the electronic store. Before trying to fix it, you should remove the battery first. After that, open up the complicated head by opening the machine. Make sure that, you have connected the head properly with the machine. Now, you will have to press down the head with ease. If you are facing any kind of complicated issues, then you should attach head tightly to the machine. You should remove the additional pins from the machine and insert them again in the machine. It isn’t a complicated task, but you will have to pay enough attention to the machine. First of all, you should remove the power supply from the plug. After that, remove the case from the machine. If you have removed the case, then remove the teeth carefully from the unit. It isn’t an intricate task because it doesn’t take a lot of time. Inspect the machine properly, and you will know the conditions of the teeth. If teeth require any kind of replacement, then you should purchase it from restaurant or Manufacturer Company. Like, most of the companies are furnishing teeth in the cheaper worth. So you are facing problems with Grinder teeth? You should read the above-mentioned follow steps and resolve such a complicated issue. Why is regular servicing vital? If you aren’t getting the services at the exact time, then you will face the friction problem. It is a perilous problem that you will encounter while using the meat grinder. If you are buying the Fresh meat, then you will grab in the messy conditions. Want to resolve such a problem? After getting the meat, you should put it into the Freeze for almost thirty minutes. Make sure that you are grinding the boneless meat that would be helpful for you in the long run. Most of the people prefer dry meat, but you shouldn’t put dry meat in the grinder. Like, it would be better to add some olive oil or additional fat in the blender. You must follow such a tip that is helpful in avoiding the issue. If you want to save plenty of hours, then you shouldn’t buy dry meat. So you are grinding meat? Make sure that you are grinding the cold meat that would be beneficial for you. Don’t use dry beef because it would be dangerous for the brushes. Are you familiar with grinder teeth? Most of the people are facing issues with the grinder teeth. If you aren’t using sharp teeth’s, then don’t grind the teeth because it can be dangerous for the machine. You will find thousands of people are facing complication with power supply. Therefore, make sure that you are using the right power supply. Before buying the machine, you should check out the mandatory issues with electric supply. Moreover, you can buy an additional battery from the store. You should check out the voltage of the battery. After that, you must check out the power outlet that connected to the machine. If you are very health conscious then buying an electric meat grinder would be perfect for you. But before investing your money, you must always make sure to check out the complete features of the electric meat grinder model that you wish to buy. Also, don’t forget to go through the user manual of the device, to better understand how to use it effectively.